When you are in the business which requires customized orders to be fulfilled, you can use the option of purchase order in Tally ERP 9 with GST. There are many businesses which run on orders because the products require time to get processed. And, that is where, purchase order comes into the picture. Today, we are going to look at everything related to order processing in tally. Suppose you are selling customized printed t-shirts. So you give an order of 20 black t-shirts, 30 white t-shirts and 50 grey t-shirts to the t-shirt company. The order will take 10 days to be produced and delivered to you but you have to make half the payment for the order to get placed. In cases like this, we have to use the purchase order voucher in tally. This is just one order. If there are 10 orders like this daily, it will be difficult to track every detail of each of the order if you are doing it manually. Therefore, today, we are going to see purchase order processing in tally and I’ll explain each and every thing about purchase orders in tally with GST. The word purchase order can be easily misunderstood because I also misunderstood it at the time of writing this post. When we say, purchase order, does it mean you get an order to sell something? Or, you are going to purchase something for which you are placing the order? It is a little bit confusing and that is why it is good to know the meaning of purchase order in tally. In tally, when I say purchase order, it means, you are going to buy something in the future for which you are placing the order right now. You can use the sales order in tally, if you get order for selling something. After creating the purchase order entry in tally, when you actually purchase something, you will pass a simple purchase entry in tally. This purchase entry in tally will be connected to the purchase order in tally with the help of an order number about which we are going to talk later in this post. Now that you know the meaning of purchase orders in tally, you will not be confused as to what is a purchase order. Let’s go ahead and see how you can enable order processing in tally. In order to use the option of purchase orders in tally, you have to first enable purchase order processing in tally. Here is a step by step process to do that. From Gateway of Tally, go to Features by pressing F11. Then, go to Inventory Features by pressing F2. Under Order Processing, there is an option of purchase order processing. Type Yes against that option and press CTRL + A to save or accept the options. Congratulations! You have successfully enabled order processing in tally. Now, we will look at actually creating a purchase order in Tally ERP 9 with GST. Creating a purchase order is very easy. In fact, it is almost same as creating a purchase voucher in tally with GST. Let’s take an example of a purchase order in tally with GST. You are in the business of printing customized t-shirts. We have seen this example in the introduction of this post. We are going to take that forward. 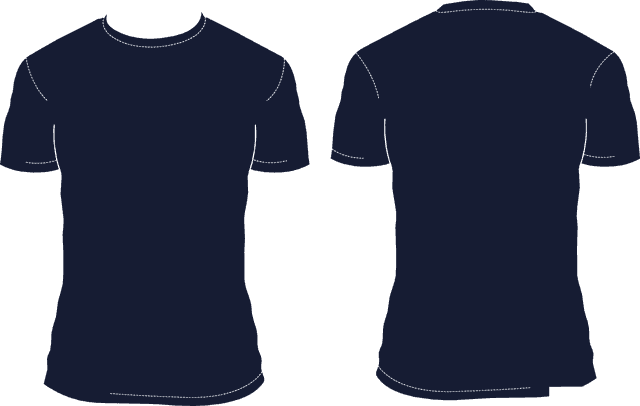 For you to print on the t-shirts, you need some plain t-shirts for which you are going to give an order to the t-shirt company. You have put a purchase order of 20 black t-shirts, 30 white t-shirts and 50 grey t-shirts. The entire order attracts 18% GST and you and the t-shirt company are in the same state. Now, to do the above purchase order entry in tally, we need to create some ledgers and stock items with the GST configuration. If you are confused which accounting category to select under which ledger, check out this list of ledgers in tally for that. 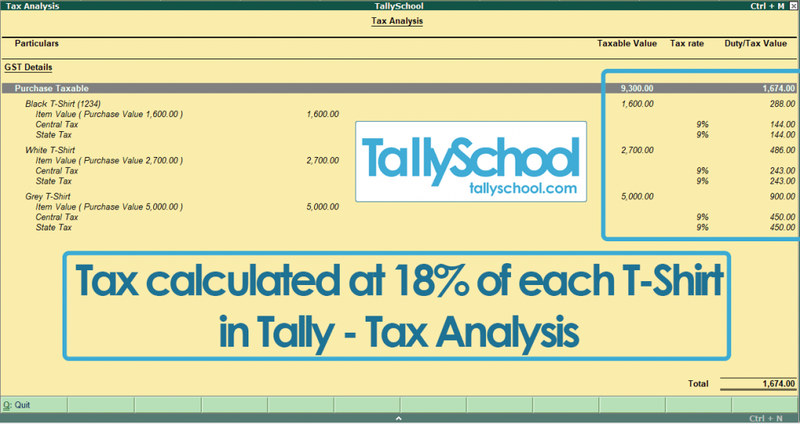 You can easily learn how you can create ledgers in tally as well as stock items in tally here. 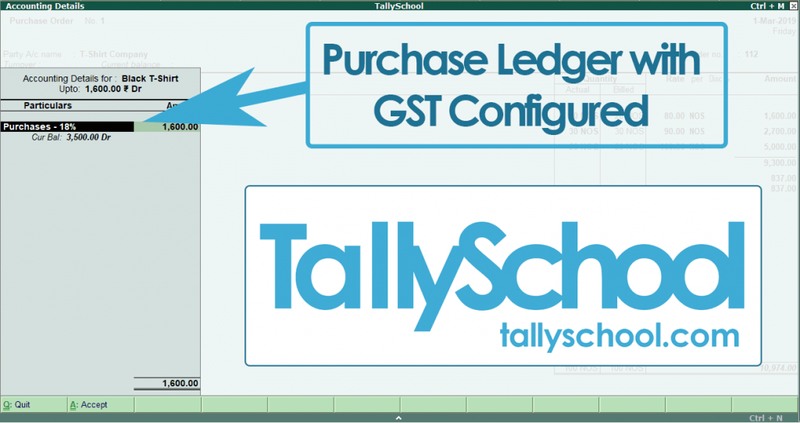 Also, you can learn step by step method to configure GST options in ledgers and stock items in tally here. I am not going to discuss about creating ledgers, stock items and configuring them with GST because I have explained that in different posts and videos which are listed above. It will also make this post much longer. 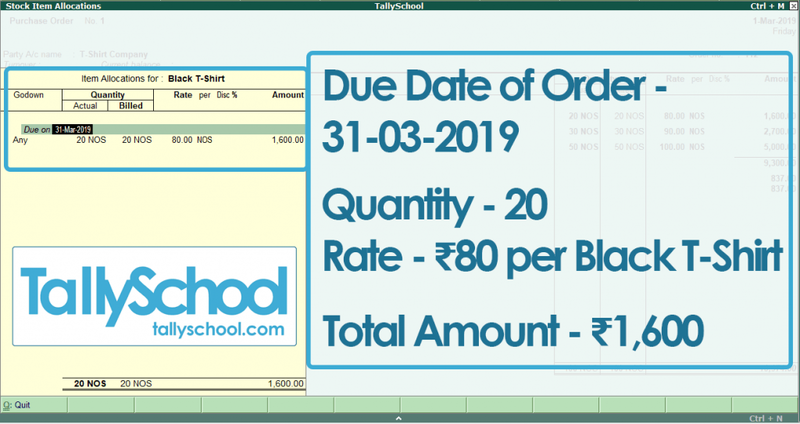 Now, let us start with the method of creating a purchase order in tally as per our example. From Gateway of Tally, go to Order Vouchers. Select Purchase Order from right hand side green bar or press ALT + F4 which is the shortcut for purchase order in tally. Now, you will be in the purchase order voucher. Select appropriate date and press Enter. In the Party A/c name, select T-Shirt Company. My state is Gujarat and therefore I have selected Gujarat as the state of the T-Shirt Company as well. Now, type in the Order Number which is 108 for this example. In the next option, select Black T-Shirt and the due date will be 31st March, 2019. Quantity for black ones will be 20 and rate will be ₹80. As soon as you’ll press Enter, you will see a grey window on the left hand side of the screen called Accounting Details. Select the purchase ledger there which will be Purchases – 18% because of 18% GST. Now, a small window will popup in the middle of screen asking you if the transaction is purchase taxable which means the transaction is intra-state. It is called GST Tax Classification in Tally. Now, repeat above step of selecting Black T-Shirt for White and Grey T-Shirts with their respective rates. It is exactly same except the rates. 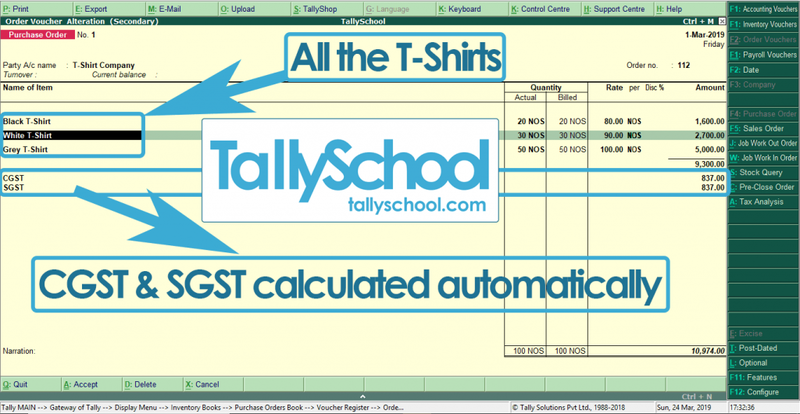 After you have entered all the 3 t-shirts, it is time to select the GST ledgers in tally. Select CGST and IGST and tally should automatically calculate the GST for you. Now, you can also press ALT + A to check the tax analysis and can see the tax calculation and breakup of each of the t-shirts and in total as well. Finally, press Enter a few times and save the voucher. Congratulations! You have successfully created a purchase order with order processing in tally with GST. Now, we are going to look at purchase order book and some alterations in the purchase order. After you have created a purchase order, how are you going to find it? Ever thought about that? Well, you can check all of your orders in Purchase Order Book in tally. From Gateway of Tally, select Display. Now, go to Inventory Books. And, finally, select Purchase Orders Book. You will see a list of all the purchase orders month-wise. You can go into each month and see the list of all the purchase order for that particular month. Find the order that we have just created and go into that. And, we are in the order alteration mode all of a sudden. Now, you can alter or edit the purchase order as per your wish. I am going to explain you, how you can alter the terms and conditions & the order number in a purchase order in tally. So, you are in the purchase order alteration screen or simply in the purchase order voucher in tally. Press Enter a few times and come to the Party A/c name which in our case is the T-Shirt Company. Again, press Enter and you will see a yellow window on your screen on the left hand side which is called Supplier’s Details. In that window, you can see there are options for Order Details as well. There, you can add terms of payment, other references and terms of delivery which basically means terms and conditions of an order. There you go! Now, you know how to add terms and conditions in a purchase order. Of course, you can also do it while creating a purchase order. But, this is just another way. 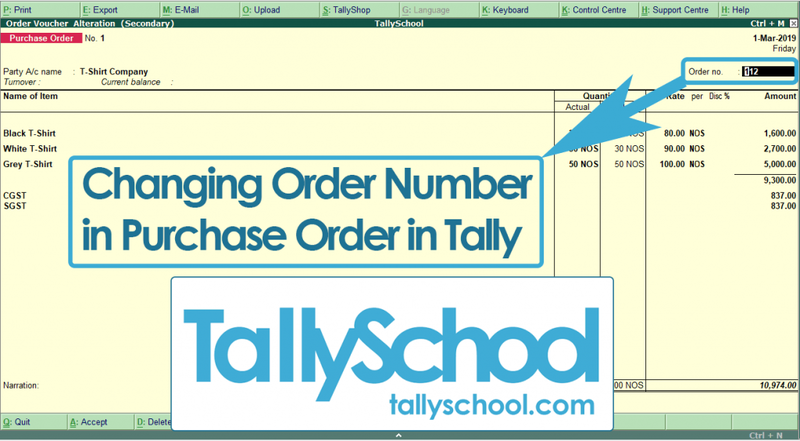 Now, let me show you how you can change the order number once the order is created in tally. We have already created a purchase order with the order number of 108, if you remember it. Because I do. We will change it to 112. We are already in the purchase order that we have created. And, you might have entered some terms and conditions as well. Save it in that yellow window and you will be on the option of order number. Simply change it to 112 instead of 108. And, you have changed your order number. Press CTRL + A to save it and you are done. Now, if you get a purchase order, you know what to do in tally to record that. We have seen what is the meaning of purchase order and how you can enable it. 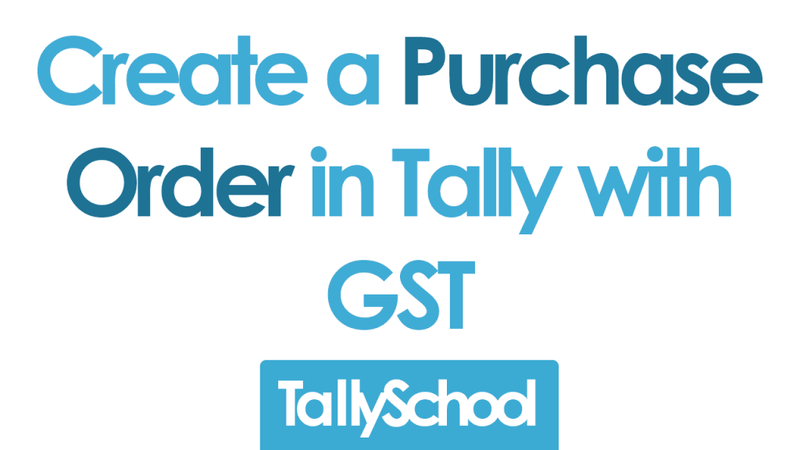 You have also learned that exactly how you can create a purchase order in tally with GST. And, lastly, you have also learned that you can alter the purchase order in tally if you want to change something in a purchase order. And, lastly, if you still have any doubts or questions or suggestions, I am always open to that. Comment down below and I’ll try to solve your problems. Pls share me what is gross profit b/f and gross profit c/o. Gross Profit B/F means brought forward. It means we bring the profit forward as the opening balance from last year or anyother account. Gross Profit C/O or C/F means Carried Over or Carried Forward. It means we carry forward the closing balance of the profit from last year or any other account. Difference in the opening balance can be removed easily in tally but checking the opening balance sheet in tally. Change the date to opening date – 01-04-2019 on both the start and the end date. Then, check the balance sheet and see where the difference is. This way you will be able to check the difference and correct it.